Colonial United Church of Christ’s new minister, Reverend Aaron Roberts, may have spent much of his life in the Midwest, but the Spokane, Wash., native has seen places far afield. In the late 1990s, when he was working at a dot com in the Twin Cities (before he’d entered the ministry), Roberts got involved in the Russian Farm Project, an initiative to bring modern tools and equipment to under-developed rural areas of the former Soviet republic. And while enrolled at Eden Theological Seminary in St. Louis, Roberts spend a summer studying abroad in India. 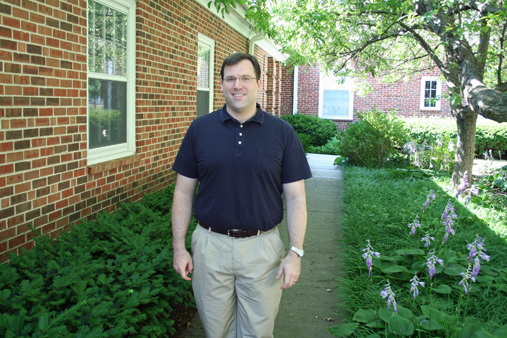 Roberts began his appointment at Colonial on June 1, coming to the church from Plymouth Congregational United Church of Christ in Fargo, N.D., where he had served since 2005. Roberts said that though he wasn’t necessarily looking to leave his post in Fargo, the Colonial congregation’s welcoming atmosphere and dedication to mission work made the opportunity too attractive to pass up.